During the month of October Sarah Bourque, Kathleen Earley and Laurie Glassman attended a workshop, led by educational consultant Sarah Ward, discussing the varying abilities of students’ executive functioning skills. Within a school day, teachers are modeling and building the foundation for students to take ownership of classroom routines. For these tasks to remain consistent and efficient, Sarah Ward encourages students to rehearse these actions in their heads. For example, when a student arrives at school he or she should be thinking “I put my backpack in my cubby, take out my materials and go greet my teacher.” This internal process, however, is more natural for some students than others. For students with executive functioning difficulties, they are not yet able to plan out these necessary steps. They need consistent reminders on what to be doing and what materials to collect. One valuable classroom suggestion we learned was to take pictures of students in their “future” moment. In other words, completing the “done” portion of the task. 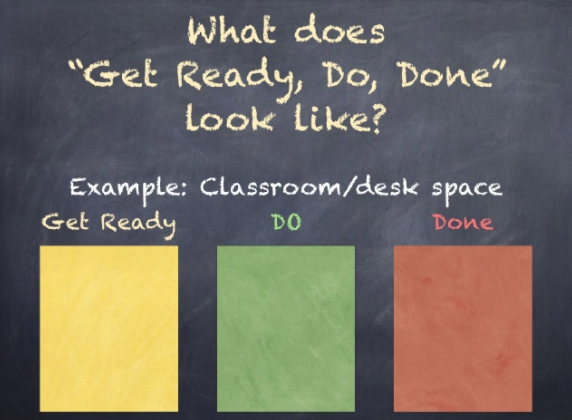 As students see the “done” portion of the task, they internalize and self-monitor the steps needed to get there. These visual reminders have been helpful to many students in our classrooms as we think about how to foster independence in the early elementary grades.